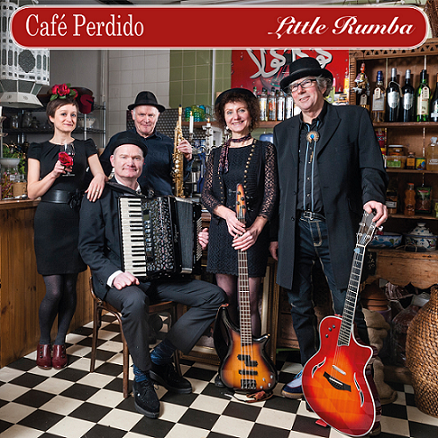 Little Rumba, one of the most popular bands of the Marches, is well known for not only their originality but also their humour and a unique blend of styles. John Hymas, (violin, viola and accordion) founder member of Hoover the Dog, Pete Mustill (singer and Guitarist) led formation of the Tango Band, and also joined with Hugh Colvin to gain top third album in the Czech charts! Hugh is the bands saxophonist producing exciting material, and Jacqui Savage stimulating bass player who has worked with a series of border bands. For this concert they will be joined by fabulous Welsh singer and song writer Jess Hall who also features on their latest album “Café Perido” as well as performing with the band “Poisson Rouge” on their video. The band write all their own music and over the years have developed a recognizable house style owing debts to East European to South America as well as jazz and blues. In fact when I heard Poisson Rouge being played, I could hear shades of Sidney Bechet playing the haunting Petit Fleur, which was being played all over Paris in the Summer of ‘58, where I stayed for a few days when hitch-hiking through France. So we are really looking to this our final gig for this Spring but we hope to see you all again in September when we launch our Autumn Programme. Tickets £10 available from John Thomas Florist, Burway Books, or C.S. Town Council Office or online at bit.ly/shi-events. For more information please ‘phone 01694 720132. The Silvester Horne Institute is available for hire. The main auditorium and balcony seats 200 people. In addition there is the Christine Harvey Room, Council Chamber and committee room and Kitchen. These facilities can be booked separately. Please contact the Council Offices (Town Council Office 01694 722113) for more information.